← Who’s Home Is It Anyway? I love Christ­mas! Not for the fren­zy time that Christ­mas brings for most peo­ple as they are out in the shop­ping malls. They start out fight­ing for park­ing spaces just so they can join the thou­sands try­ing to find that great bar­gain on that per­fect Christ­mas gift. I learned a long time ago not to be part of that group, how­ev­er because I love peo­ple and peo­ple watch­ing, it is fun just to sit and watch peo­ple dur­ing this time and see their dif­fer­ent facial expres­sions. In recent years, I have noticed more and more par­ents, with their chil­dren in hand, out shop­ping for their Christ­mas presents. Is there no mean­ing to Christ­mas? Is Christ­mas more than just presents? With out a doubt, it is for me. It’s a time of reflec­tion as I think about how in scrip­ture the old tes­ta­ment spoke of this birth, a savour that would be born, long before it ever hap­pened. Can you imag­ine wait­ing each year won­der­ing when this birth would take place, and then the excite­ment when the news spread that our savour was born. There were no peo­ple with Black­ber­rys, or Ipods, or any news crews to spread the word, but God Him­self nine months before the birth sent His angel to Mary to let her know she was cho­sen to car­ry God’s gift to us. In one of the more recent Christ­mas songs, “Mary Did You Know?”, the words ask the ques­tion, Mary did you know, that when you kiss your lit­tle baby, you have kissed the face of God. I’m sure she did! Jesus was our gift God had promised many years before. At Christ­mas we need to slow down and hold that gift God unwrapped for each of us. Jesus, our gift from God. As I pre­pare each year for Christ­mas, I start the process of grab­bing all the con­tain­ers stored away in the attic that car­ry all our dec­o­ra­tions. It’s amaz­ing how each year those box­es get a lit­tle heav­ier and a lit­tle fuller. Inside those box­es are many mem­o­ries of Christ­mas past, and many spe­cial gifts my mom has made. It’s like a trea­sure hunt each year as I unwrap these spe­cial hand-made gifts we have received. Mom has so many tal­ents when it comes to sewing and paint­ing, and even poet­ry. All these gifts adorn our home. Some stay up year round, while oth­ers are packed away with as much lov­ing care as she put into them. One of Tami and my very favorite Christ­mas gifts are a fam­i­ly of car­ol­ers around a light pole. Each fig­ure is cut out by hand, then paint­ed and dressed with the clothes she sewed for each of them. 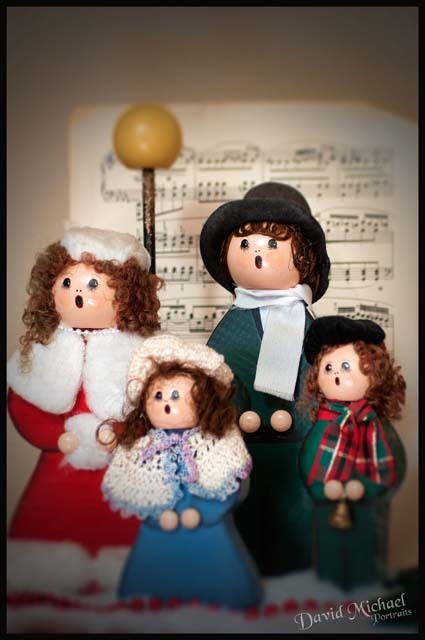 Each beau­ti­ful lit­tle face, with open mouths as they sing about the birth of Jesus. This blog is to say “Thank You” mom, for all the love you give, and the spe­cial Christ­mas gifts that I unwrap each year that mean the world to me. To all that read this, may God Him­self bless you beyond mea­sure. This entry was posted in No Category and tagged Christmas, Christmas Gifts, Jesus. Bookmark the permalink. Awe­some read, Dave. I read a fab­u­lous book once called “The Sacred Romance.” about how God’s love for us, when it is right, fills us with a sense of that euphor­ic “all is well with the world” feel­ing we chase so hard after. I’ve real­ized as the Christ­mas sea­son starts up this year that all the “mag­ic” that mer­chants try to cre­ate at Christ­mas with the lights and songs and.…. is sim­ply their way to fill us with the illu­sion of that “romance”. But if we don’t already HAVE that romance, it makes us feel emp­ty and still aching for it. But if we DO, the mag­ic of Christ­mas is not an illu­sion… it is real, and all the lights and music and Christ­mas sto­ries enhance that romance. It sounds like you get it — so I rejoice with you in your Divine Romance with the cre­ator of what Christ­mas is all about! Great post and well stat­ed. Christ­mas is about Him, but the per­son who remains me most of Him, is my mom.